Small home facades can easily look cute and cosy, but what if you want to create this look with a modern design? Well, today's diminutive home project will provide lots of answers! 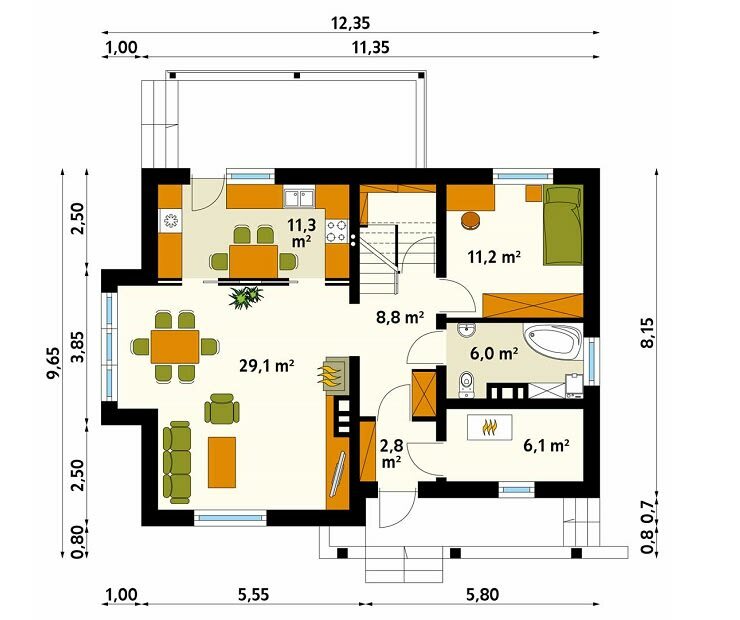 The home is relatively small when you consider it can house four people. So the architects have created a lovely outdoor entertaining area with a covered terrace and a floor made from timber. It gives the rear facade an open, friendly feel while also providing a good counterpoint to the rather private window and door designs. 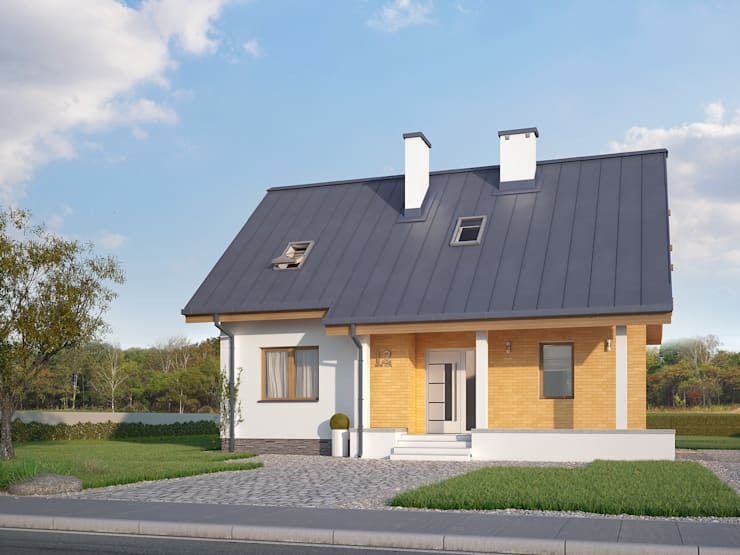 The roof has also been designed in two parts that gives the home a classic feel and both front and rear exteriors could be used as a main entrance. Like any good family home, it exudes a sense of stability. The white walls are made from 2-ply structural clay tile and the ceilings are made from reinforced concrete so it's a very sturdy building. 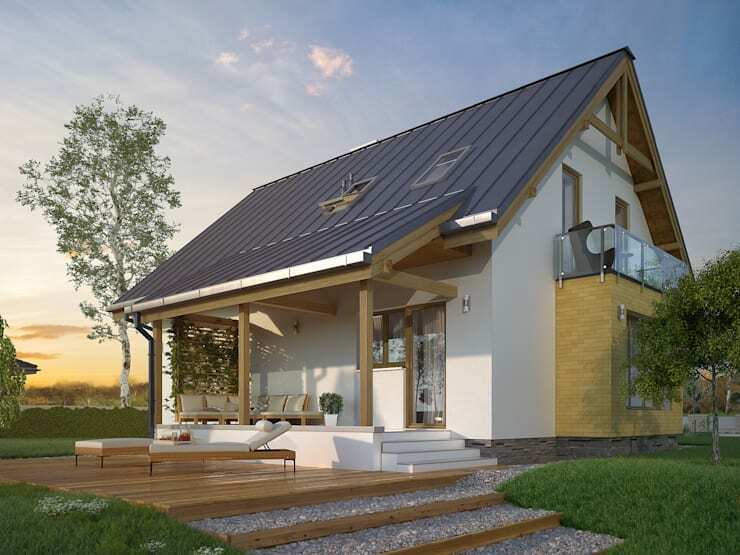 This is a prefabricated home, so many of the aesthetic finishes can be customised to suit your preferences. Finally, from this angle we also get a glimpse of the small upper balcony running off the upper-level landing. The roof rises at an inclination of 40 degrees to create a high ceiling space and a rather compact design. 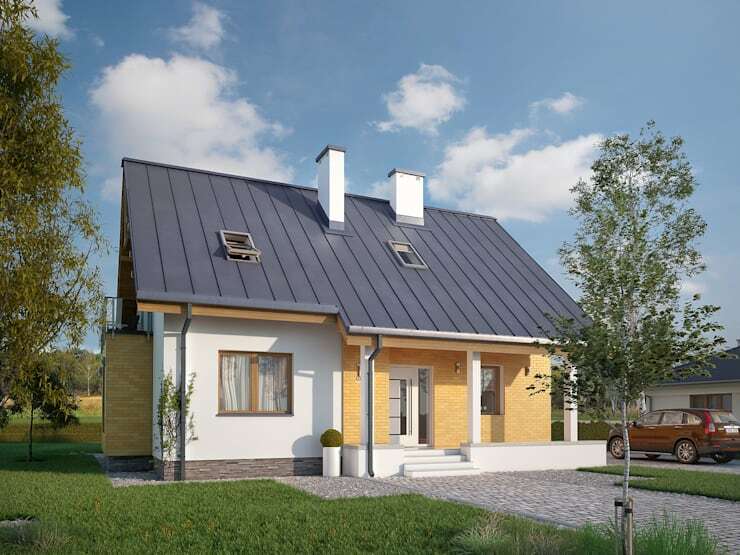 This design means that the upper level attic area can be used for the sleeping areas and the house can be built on a plot of just 20.35 x 18.75m. This makes it quite suitable for an urban area. If you have more space of course, a driveway could be added too. A soft mixture of stone materials could help integrate the entire facade into the surrounding landscape. 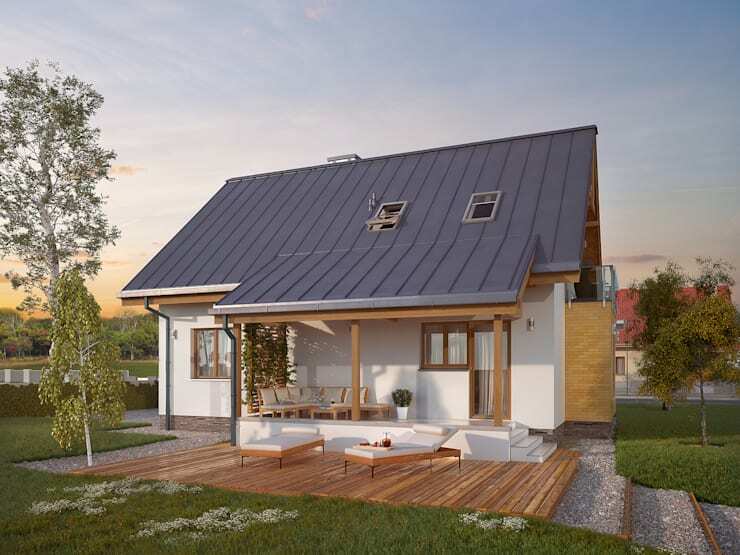 The steeply sloping roof is made from a metal standing seam from the Finnish company Ruukki. The steep incline means that the quality of the roofing becomes an important part of the aesthetic facade as well. A peaked roof like this also harks back to a classic home design. Note the skylights and just how much privacy they would provide. The advantages of the ground floor plan are many; the kitchen has direct access to the covered terrace, the living and dining room are joined and there is a fourth bedroom that could easily be used as a separate office hideaway. There is also storage space under the stairs and the first of two bathrooms. On the second floor/attic level, we have the three other bedrooms, an additional room/office and a family-sized bathroom. 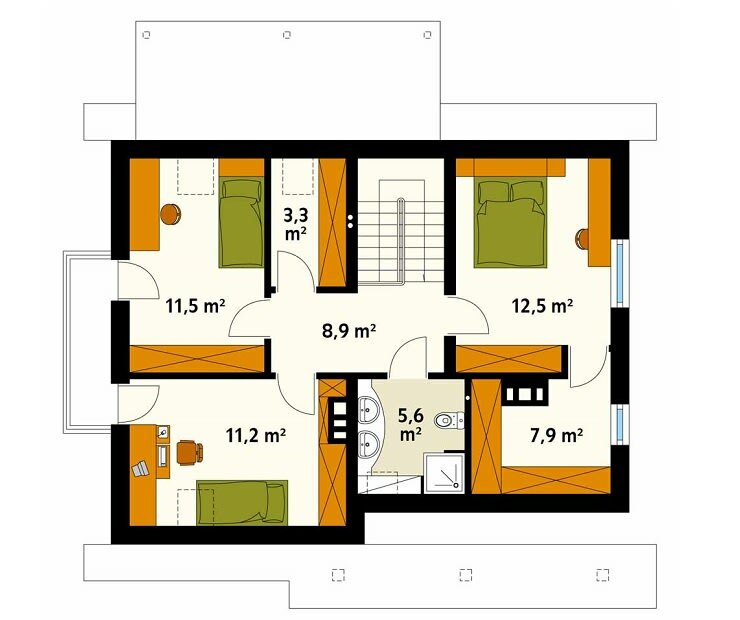 There is also a dressing room connected to the master bedroom that some might want to turn into a bathroom. The standout feature, however, has to be the open balcony that runs off from one end of the hallway. It can also be directly accessed from the master bedroom. For more home facade ideas, have a look at 6 stunning but simple fence ideas for your home. What do you think of the facade of this home?